Huskies Athletics is rethinking the all too familiar husky howl and welcoming a new mascot at the start of the fall 2015 season. "Spring is a time for renewal and we decided we needed a change too," said Basil Hughton, athletic director for the Huskies. "Who we are, how we present ourselves to the world, it matters more than ever." Hughton couldn't hide his excitement as he introduced the new Huskie Athletics mascot—a duck-billed platypus named Plucky. 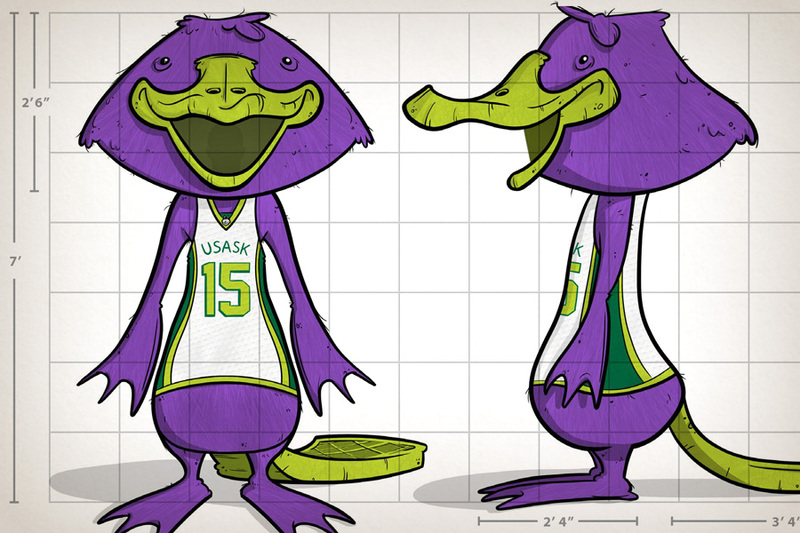 Designed in-house by Marketing and Communications, a sneak peak at the costume design is available with the Plucky the Platypus Mascot Standards Guide pdf. "Our 'We are All Huskies' campaign just doesn't ring true anymore. Some of us aren't," Hughton explained. "Howler is edgy, tough, determined and not to be messed with. Plucky is our softer side. We think some people will relate." Huskie Athletics doesn't plan to retire Howler just yet. The program, which trains more than 400 athletes each year and represents the university on the Canadian Interuniversity Sport stage will still be known as Huskie Athletics, but Hughton's hope is that the U of S will also become known for its gentler side represented by Plucky. "We plan to roll out the new mascot for some promotional events and at games to act as a foil for the sharp-toothed dog." "Oh that was easy," said Hughton. "He's cute, a little exotic, but has characteristics of a few animals native to Saskatchewan—a duck bill, a beaver tail and otter feet." A costume is now on order and the Huskies will be hiring for games starting in the fall 2015 season, explained Hughton, adding, "Happy April Fools' Day!"